All Buildings offer you output of some kind of resource or Workers. The requirements you must fill (in Workers and resources) are shown at the top of the card. The Output you receive is shown at the bottom of the card. This Output is always taken from the General Supply or recorded on the matching track. Mines produce Yellowcake: When you place Workers on a yellow Mine card, take the number of Yellow- cake shown from the General Supply. 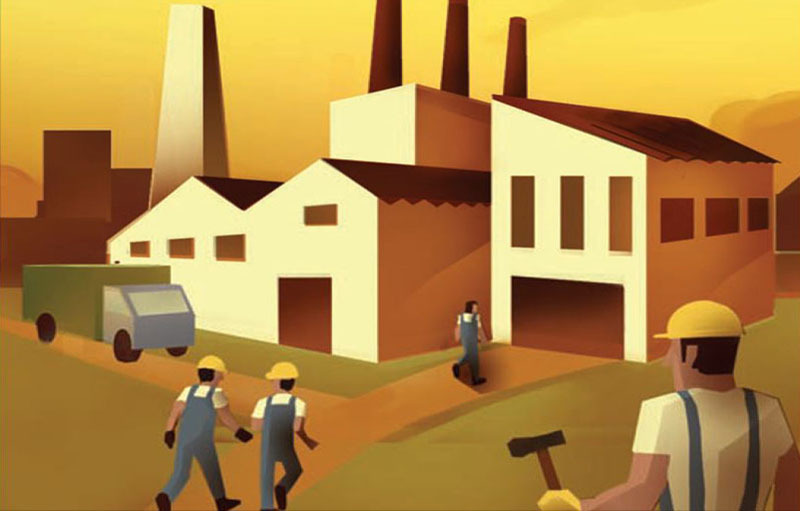 Factories produce Money and/or aircraft: When you place Workers on a green Factory card, take the Money shown (if any) from the General Supply. Also, increase your supply of Fighters and/or Bombers on the tracks of your Player Board by the amount shown (if any). If the Factory card shows different resources separated by a slash (/) you have a choice: you can either collect the resources before or after the slash (not both). You can have a maximum of 10 Fighters and 10 Bombers at any time, as indicated by the tracks on your Player Board. Universities produce Workers: When you place Workers on a purple University card, take the type of Workers shown at the bottom of the card from the General Supply and add them to your personal supply. You may use these Workers right away. You may take any combination of permanent Workers in your color and/or Contractors (depending on availability). If the University card shows different types of Workers separated by a slash (/) you have a choice: you can either collect the Workers before or after the slash (not both). Enrichment Plants produce Enriched Uranium: When you place Workers on a red Enrichment Plant card and pay the required Money and Yellowcake to the General Supply, raise your token on the Enriched Uranium Track on the Main Board the amount shown on the card. You may not store more than eight units of Enriched Uranium at a time. You will need to build a bomb (or use a Reactor) to reduce your stored Enriched Uranium. Reactors produce Plutonium: When you place Workers on a grey Reactor card and pay the required Yellowcake or Enriched Uranium, raise your token on the Plutonium Track on the Main Board the amount shown on the card. Some Reactors show an Enriched Uranium next to the Yellowcake as part of the requirement costs, separated by a slash (/). When using one of these Reactors, you must choose to pay the Yellowcake shown or pay one Enriched Uranium instead. You may not store more than eight units of Plutonium at a time. You will need to build a bomb to reduce your stored Plutonium.